As flood waters begin to recede in the wake of Hurricane Isaac, folks who live in communities along the Gulf Coast are assessing the damage and their options. NBC's Gabe Gutierrez reports. Updated at 10:30 a.m. ET: The remnants of Hurricane Isaac were grinding slowing northward early on Saturday with its center now deep into Missouri and the heavy rain stretching for hundreds of miles east into Illinois amid reports of tornadoes and high winds, meteorologists said. Drought-stricken areas of Missouri and Illinois were easily absorbing the rain Friday and the system was expected to soak the region deep into Sunday, said Jayson Gosselin, meteorologist with the National Weather Service's St. Louis-area office. "We have gotten pretty widespread light to moderate rain that has piled up," Gosselin said. "The rain is certainly going to help our drought situation up here." Most places in the area were reporting 1 to 3 inches of rain by late on Friday and were expected to see up to 5 inches of rain through Sunday, though some might see "upwards of 5, 6, 7 inches," Gosselin said. A wide swath of central Illinois from west to east was expected to receive similar amounts of rain as the system slowly passes through the state, the weather service said. The Weather Channel's Julie Martin takes a look at how the weather conditions are affecting crops in the Midwest. The weather service received reports of two tornadoes in Illinois and one in Missouri on Friday that caused what looked like fairly minor damage, Gosselin said. Two possible storm tracks will probably be surveyed on Saturday, he said. The rain has been fairly consistent, and due to drought conditions and low river levels there have not been any reports of flash flooding or river flooding so far in the area, he said. The slow-moving tropical depression dropped up to 8.5 inches of rain in Pine Bluff, Arkansas, where there were several flash flood watches and warnings on Friday. Many more Arkansas cities reported rain totaling 5 inches or more. Communities damaged and flooded by Isaac get food aid and a visit from a presidential nominee as they start to mop up. The system was expected to gradually turn more east from the Mississippi River valley into the Ohio River valley by Saturday night, bringing heavy rain into the central Appalachians by Monday and Tuesday. Missouri and Illinois were both expected to see steady rain into Sunday, forecasters said. State emergency agencies, city and county leaders and utility crews have been preparing for the deluge. In Indianapolis, a line of about 100 cars snaked from a Department of Public Works lot where free sandbags were being distributed Friday. Residents could pick up bags filled with 30 to 50 pounds of sand. Jenny Bland, 50, of Indianapolis, waited in line more than 90 minutes so she could pick up bags for her family and elderly neighbors. "People are taking this very seriously," Bland said. As President Obama stumped in Iowa ahead of the Democratic National Convention, Mitt Romney beats his campaign opponent to New Orleans to assess hurricane damage. NBC's Kristen Welker reports. Fears were well-founded in Arkansas, where some areas have had more than 6 inches of rain since Thursday, and thousands lost power. Tornado warnings were issued for several counties, but no touchdowns were confirmed late Friday and there were no reports of injuries or damage. Brian Smith, senior forecaster for the National Weather Service in North Little Rock, said remnants of the hurricane were still affecting central and northeast Arkansas late Friday. Showers and thunderstorms were possible in the northern half of the state Saturday, he said. NBC's Brian Williams speaks with New Orleans Mayor Mitch Landrieu and Plaquemines Parish President Billy Nungesser. At least four deaths were attributed to Isaac in the Gulf Coast. Residents were cleaning up on Friday, looking for electricity to be restored slowly and energy companies were getting ready to resume operating offshore rigs. Isaac was the first hurricane to strike the United States this year and hit New Orleans almost exactly seven years after Hurricane Katrina devastated the city, causing an estimated 1,800 deaths. 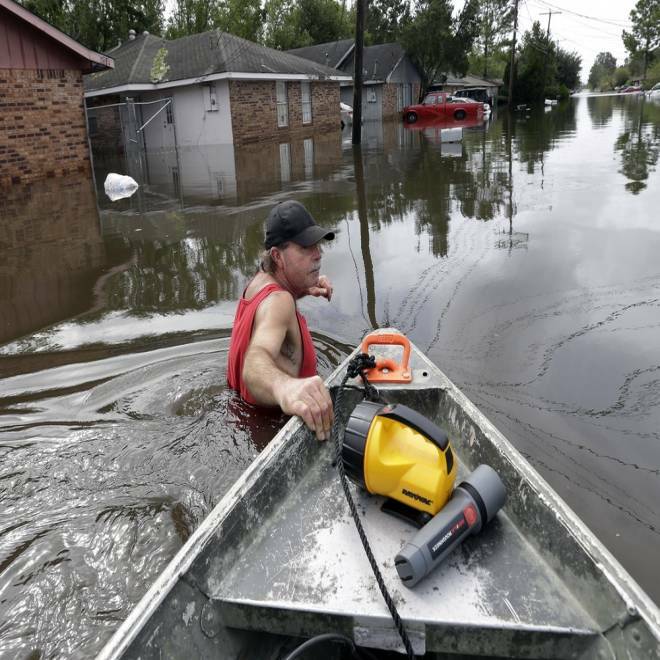 Isaac caused widespread flooding and property damage in the U.S. Gulf Coast region. More than 500,000 homes and businesses remained without electricity across Louisiana, Mississippi and Arkansas on Friday afternoon. The system lingered over New Orleans for the better part of two days, providing a first and successful test of the city's new $14.5 billion flood-control system assembled after Katrina. Areas outside those flood protections fared worse. At least one levee was overtopped southwest of New Orleans, leaving some homes under 12 feet of water. New Orleans was struck by 20 inches of rain, many other locations in Louisiana and Mississippi logged more than 10 inches of rain. A man, forced to abandon his sailboat during Tropical Storm Isaac, is now trying to find the vessel. WPMI's Darwin Singleton reports. NBC News staff, Reuters and The Associated Press contributed to this report.